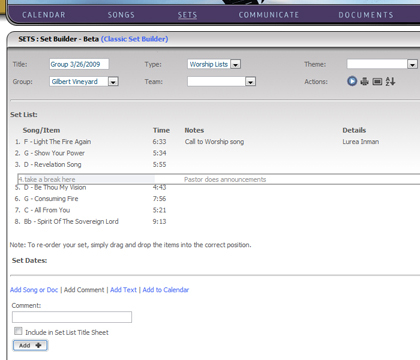 We have finished adding all of the latest Vineyard Music songs into the Worshipteam.com system library. This includes albums from Jeremy Riddle (The New And Not Yet), Sheri Carr (Fearless Now), Chris Lizotte (Signal Hill Revival), Ryan Delmore (The Spirit, The Water and the Blood) as well as many other songs from ION Worship including albums from Steve Mitchenson, Sean Dayton, Michael Larson, David Ruis and Andy Park. Worshipteam.com has been a partner of Vineyard Music USA, Vineyard Records UK and ION Worship (Canada Vineyard) for some time and is pleased to continue to include and offer all their catalog of songs in our service. We just added a new, drag and drop, user friendly set builder. When you click to edit a set now, you will see your songs and items in your set. Each song listing (or field of information) will be editable by simply double-clicking into the information you wish to change. If you want to change the order of a song list, simply grab the item (with your cursor) you want to move and drag it to the position in the list you wish it to appear. Then drop it. It is that simple. This is an example of a user moving a comment (about taking a break) inside of the set. The set builder is very powerful. You can now add instant items such as songs, comments, and notes. You can add details to any item, and specify flow information in details and notes, even specifying if you have specific people doing specific songs. The layout is drag and drop and very quick to edit any field. In fact, if you are just throwing together a set for an ad hoc event, you can even put this event on the calendar right here on the set builder, but clicking “Add to Calendar” where you can chose to select a previously configured event or simply select a date and one will be auto-created for you. We just finished adding hundreds of songs from popular worship publisher Hillsong Australia. This includes their ENTIRE catalog of songs, with lyrics, chord charts and full length original audio from their recordings. 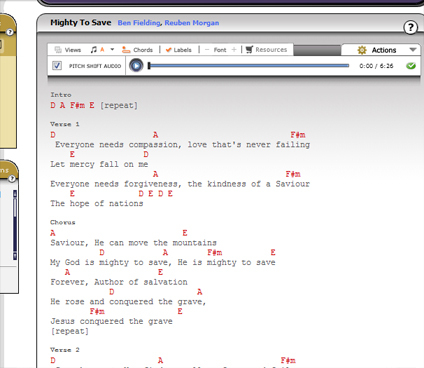 Of course, like all songs in Worshipteam.com, you can change keys, make custom versions, make capo chord charts, and change arrangements at will. Occasionally, people ask us if our service is legal, and we are glad they do! YES, we are completely LEGAL. We think it is very important to honor God in our lives, not just when we sing songs. As such, we go to publishers around the world and license legal use of their songs for use in our service- that way, you don’t have to worry about it! You subscription to Worshipteam.com includes all our song catalog at no extra cost. And you can view, print and listen to any song an unlimited number of times! You get all the benefit of us having done all this work for you, and the songwriters are taken care of – in fact, we pay out fully 50% of all the revenue we bring in from your subscriptions as royalties to songwriters, artist and music companies. Worshipteam.com is the only online worship planner that includes thousands of songs LEGALLY from many of the popular worship publishers. And don’t be fooled- your CCLI license does NOT cover using chord charts, audio or any other form of songs in an online tool like a planner. In fact, other sites and planners without licensing are hoping you won’t notice that using songs in their systems is illegal. So when you use Worshipteam.com, you can put your mind at rest- we have done the licensing for all the songs included in the service (now over 4300 popular songs and growing!). 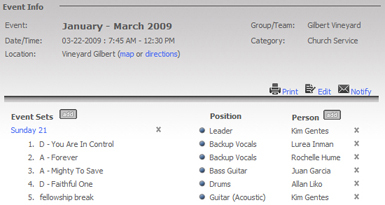 You just enjoy saving time with Worshipteam.com and planning your worship, knowing you are operating legally. All you do is select the person/skills that you wish to add to this event and click “Add” and they are added. You can remove a person by simply clicking the “X” that is marked to the right of their name. Likewise, sets can also be added and removed (using the “Add” button or the “X” buttons). Again, this is the simple event view allowing you to make quick changes to your event. Another nice feature of the new event view screen is the quick “Notify” button. This allows you to send an instant reminder to anyone about the event. Of course, you can still do the invitations to events where people can opt in/out of anything on the calendar (you do that when you use “Quick Event” or “Create Event”). 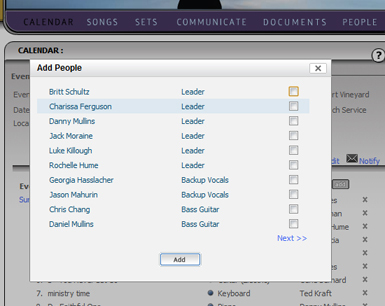 Worshipteam.com allows you to do any configuration of event management and invitation, depending on your needs. We have just added a new version of the introduction video to the site to help people understand what the service is all about. This features Don Moen explaining worship planning from a worship leaders perspective, and a explanation that includes benefits of the Worshipteam.com services.